The tumor suppressor p53 has a central role in drug-induced cell death. Its mutation in about 50% of all cancers is a source of drug resistance from the loss in apoptotic signaling, but loss of apoptosis is also found in many resistant tumors that retain wild-type p53 and this represents a paradox. Indeed, resistance seems to be substantially greater with wild-type p53 present as compared to mutant p53. From the perspective of response and survival in cancer patients, responses are observed independent of p53 gene status, but the 5-year survival rate is significantly greater when wild-type p53 is present. This indicates that an effort to increase the response rate in cancers having the wild-type p53 should translate into an increase in the survival rate. 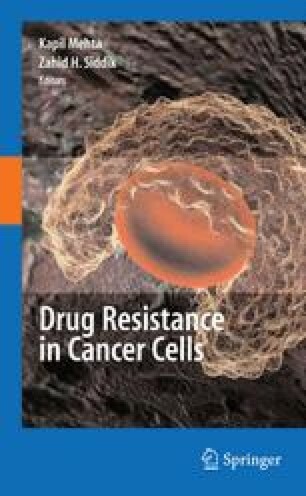 To accomplish this goal, an understanding of the mechanisms contributing to resistance in wild-type p53 cancers becomes important. These mechanisms are multifactorial and include loss in DNA damage recognition, alterations in post-translational modification of p53, failure to activate p53 due to target gene silencing, and failure to transrepress antiapoptotic genes. Supported by NIH Grant RO1 CA127263.